From the Saskatchewan Roughriders February 2, 2018, in exchange for defensive end Charleston Hughes. 2018: Did not play in the preseason…started the regular season on the one-game injured list. 2017: Appeared in seven regular season games at quarterback for the Montreal Alouettes…Registered eight carries for nine yards and one touchdown…Acquired by the Saskatchewan Roughriders, along with a fifth-round pick in the 2018 CFL Draft, August 15 in exchange for national defensive back Tevaughn Campbell, a third-round pick in the 2018 CFL Draft and a third-round pick in the 2019 CFL Draft…Dressed in 11 regular season games at quarterback for Roughriders…Completed one pass on three attempts for eight yards and added 12 carries for 33 yards and three touchdowns. 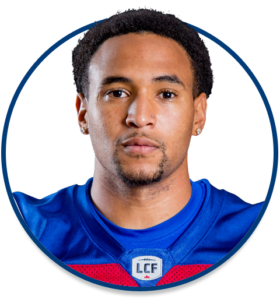 PLAYOFFS: Appeared in the Eastern Semi-Final November 12 at Ottawa and recorded three carries for three yards and one touchdown…Appeared in the Eastern Final November 19 at Toronto and posted one carry for one yard. 2016: Attended mini-camp with the National Football League’s Seattle Seahawks and Washington Redskins…Acquired by the Montreal Alouettes from the BC Lions May 20…Appeared in 15 games, starting three times, for the Alouettes…Registered 42 pass completions on 75 attempts for 575 yards, four touchdowns and one interception…Added 29 carries for 112 yards and one touchdown. College: Played four seasons at Eastern Washington University (2011-14)…Started 34 games for the Eagles…Completed 701 of 1,081 attempts (64.8%) for 10,438 yards and 110 touchdowns…Selected as the 2013 FCS National Performer of the Year after throwing for 55 touchdowns…Named Big Sky Conference Offensive Player of the Year and First Team All-Big Sky Conference twice (2013, 2014)…Transferred to the University of Oregon for senior year (2015)…Started 10 games for the Ducks, registering 168 of 259 pass attempts (64.9%) for 2,643 yards and 26 touchdowns…Added 83 carries for 147 yards and two touchdowns. Personal: Attended Alemany High School in Los Angeles California…In senior year, named Serra League Most Valuable Player after leading the Warriors to a league championship…Majored in Recreation Management at Eastern Washington…Majored in Interdisciplinary Studies (Media/Journalism, Sports and Business) at Oregon…Son of Vernon Adams and Desirae McWhorter.